Fans and creators alike often complain that it’s hard to find a proper challenge for Superman when the character is so unfathomably powerful. But as far as I’m concerned, the best Superman stories aren’t the ones that challenge him physically, but the ones that test his morals and ideals, his methods and resolve. Peter Tomasi and Patrick Gleason’s run on Superman has excelled in this respect, and issue 36 continues this streak, further defining Superman’s greatest strengths by showing what happens when he doesn’t live up to his own lofty standards. Serving as the grand finale of the “Imperius Lex” storyline, Superman 36 creates a satisfying ending to what’s been an ambitious, if overstuffed, tale by focusing on Superman’s ability to inspire others. Tomasi, Gleason, and artist Doug Mahnke make a gem of an observation here. Superman is a beacon of hope, of course, but his true ability to inspire comes, not from what he can do, but from his faith and belief in the inherent goodness of everyone. 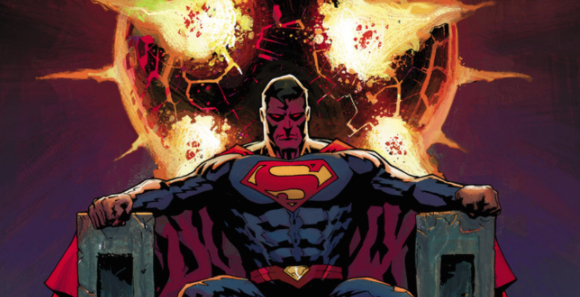 Apokolips is a dark, twisted world built on humiliation and despair, but in his brief time there Superman sees the potential for more, and it’s that faith that allows compassion and hope to bloom on Apokolips. That’s a clear victory for Superman, but the issue ends with a loss for him. I hate to say it, but Lex has a point. 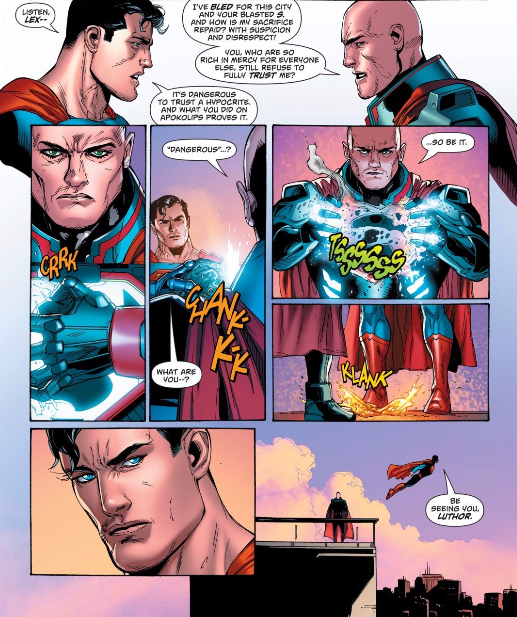 In the New 52/Rebirth he’s been more of an ally to Superman than a villain — a tenuous ally motivated by vanity, ego, and spite, sure, but an ally nonetheless — and while I don’t blame Superman for being suspicious of Lex, his inability to show him any trust or good faith — his inability to see any good in Lex — is pretty clearly a weakness. 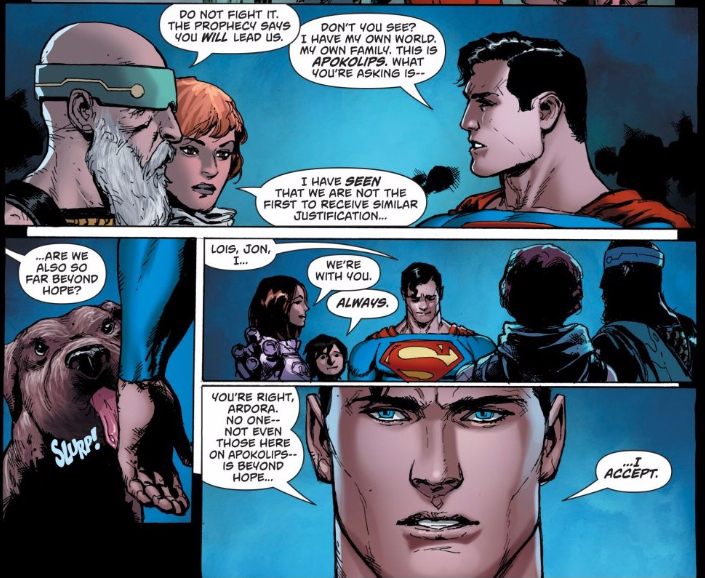 These aren’t the qualities that make Superman strong, which is why the issue ends on such a down note. Superman’s faith may have saved a planet, but his loss of faith has cost him an ally and, far worse, may have helped bring back his greatest enemy of all. I have liked Luther’s characterization here. I was a bit surprised by the heel turn at the end – maybe disappointed is more like it. I found him as an anti-hero that Superman couldn’t trust as an interesting character, sort of like Negan in the Walking Dead right now (which is still outstanding).